rocking paper & scissors: today was expo day! 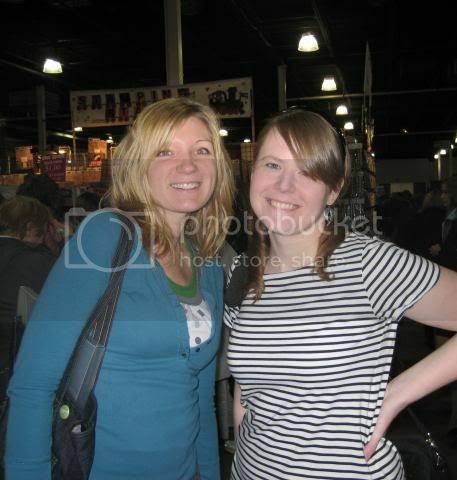 here's nicole and i all fresh faced and caff-ed up just as we arrived at the expo. the expo was like a third of the size that it has been in previous years, but there were still some great booths and i found some stuff that i had either been looking for or hadn't seen before (which is happening less and less lately, so it's fun to be surprised!) i didn't get much paper, mostly a bunch of embellies! those tiny little liscense plates at the bottom of the picture are from karen foster, they are so adorable. they are super tiny and made out of metal. 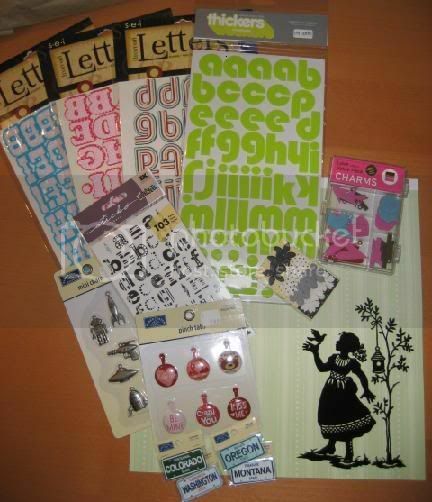 i also got a few sets of the sei iron on letters to make a bunch of my own scrapbooking t-shirts. the one font is called tube socks, how adorbs is that? so what kind of cute saying have you all seen on scrapping shirts? i have a few ideas, but would love to hear some more! Ohhh i love it all! Lucky girl u! Love the thickers! Great picks!! Is that paper a sillouette? I LOVE that! What's the company? Love al the new goodies you found! it's actually a piece of sei paper and an sei iron on silhouette.